Picture from The Mysterious Fayum Portraits: Faces from Ancient Egypt. When the Christians destroyed the Library of Alexandria under Theodosius in 391 and 396CE, the librarian was Theon (or variously Theron). We can imagine his and his daughter Hypatia's feelings as some 500 000 scrolls representing hundreds of years of collection and research were destroyed. This was a forerunner of the end of "The Golden Age". Many have argued that the death of Hypatia, only 25 years later introduced the real "dark ages" as the last light of reason was extinguished with her death. Certainly, due to the deliberate destruction of all things perceived as anti- or even, "not sufficiently pro-" Christian, we don't know very much about her, and of that, much of what we do know was written by her enemies. Yet she was such a brilliant beacon that even they could not entirely hide the fact that Hypatia was something quite exceptional. Nicephorus, Philostorgius and Socrates Scholasticus (who wrote an eccleciastical history in the 5th Century infra) mention her, and even these church apologists and manufacturers of pseudographica praised her characteristics and scholarship even as they damned her values. A few surviving letters by one of her former students who she taught neoplatonic ideas, Synesius of Cyrene (infra) and later Bishop of Ptolmais (who helped create the doctrine of the Trinity) provide some background and a few quotations, such as those used here. And then there was silence. For a long time. Many centuries later (1510ish) Raphael would allegedly submit a draft of his work, "The School of Athens", to the church fathers. 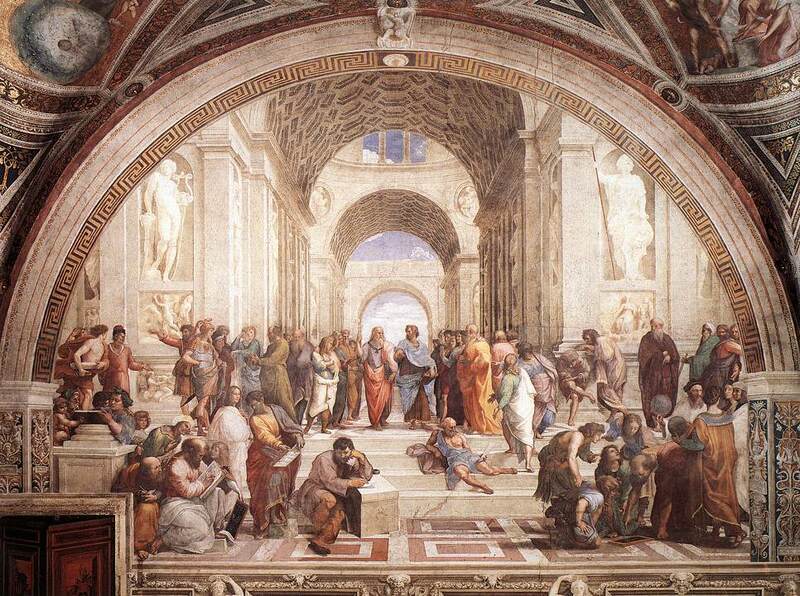 The School of Athens, Raffaello Santi (or Sanzio) aka Raphael (1483-1520). "Who is this woman in the middle?" asked the Bishops. "Hypatia, the most famous student of the School of Athens," answered Raphael. "Remove her. Knowledge of her runs counter to the belief of the faithful," admonished the priest. "Otherwise, the work is acceptable." "As you command," replied the artist, given no choice. However, he still "snuck" her back into the picture, using Francesco Maria della Rovere as his model. 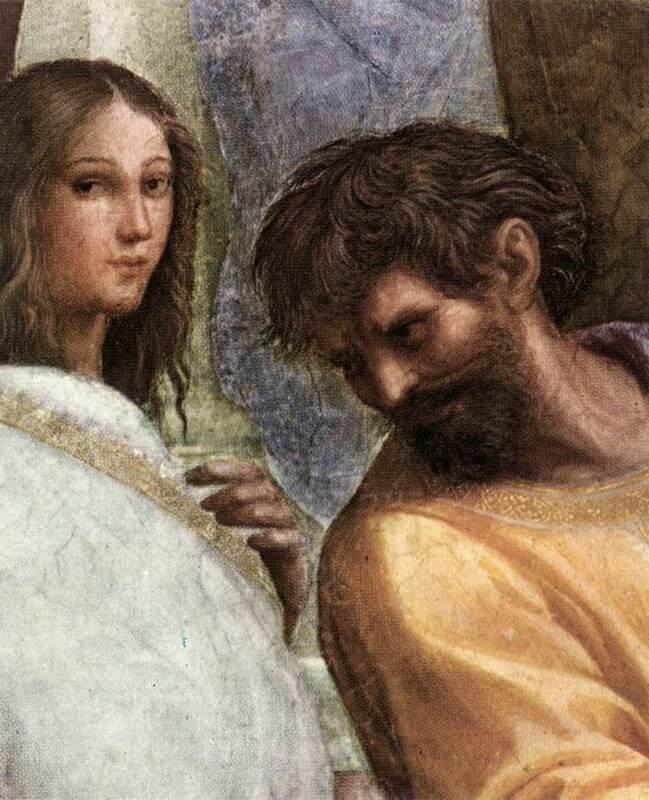 detail: The School of Athens, Raffaello Santi (or Sanzio) aka Raphael (1483-1520). However, Hypatia's story was memetically compelling and during the eighteenth century enlightenment many authors resurrected and retold it. The first, but by no means the most significant (although the foundation for many of the following works) was that by John Toland, a zealous Protestant in 1720. His, "Hypatia, or the History of a Most Beautiful, Most Virtuous, Most Learned and in Every Way Accomplished Lady; Who was Torn to Pieces by the Clergy of Alexandria, to Gratify the Pride, Emulation and Cruelty of the Archbishop, Commonly but Undeservedly Titled St. Cyril" . Voltaire, Fielding, and Gibbon wrote about her, reawakening the ire of the Roman Catholic Church, which responded with an official rebuttal, "The History of Hypatia, a Most Impudent School-Mistress. In Defense of Saint Cyril and the Alexandrian Clergy from the Aspersions of Mr. Toland." Throughout the nineteenth Century, she inspired the romantics of England and Europe, the most famous of which was undoubtedly " Hypatia or the New Foes with an Old Face", written in 1853 by Charles Kingsley (later to publish, amongst others, Westward Ho and Water Babies, probably his most famous books. But who was "the real" Hypatia and how much of her can we discern today? Hypatia was the daughter of Theon who was, as noted above, the distinguished professor of mathematics, well known even today as our primary source for the extant text of Euclid's Elements, and later the head librarian or director of the Library (or Museum) of Alexandria. Apparently, Theon intended to transform his (gorgeous) daughter into a "perfect human" and "trained" her, mentally and physically from birth. Her physical regime included swimming, horseback riding, and mountain climbing. Her social skills were not avoided. She was trained in speech, persuasion, debate, acting and rhetoric. She also learned literature, logic, physics, astrology, history, politics and philosophy. Theron taught her enough of all religions to turn her from the lot. He is said to have said, "All formal dogmatic religions are fallacious and must never be accepted by self-respecting persons as final. Reserve your right to think, for even to think and be wrong is better than not to think at all." She obviously took this to heart, as she said, "Fable should be taught as fable, myth as myth, and miracles as poetic fancies. To teach superstitions as truth is horrifying. The mind of a child accepts them and only through great pain, perhaps tragedy, can the child be relieved of them. Men will fight for superstition as quickly as for the living truth - even more so, since a superstition is intangible you can't get at it to refute it, but truth is a point of view, and so is changeable." Her mental skills were honed such that at 19 she edited the third book of her father's Commentary on the Almagest of Ptolemy. As a young adult, she did the almost unthinkable for a lady of her day, left Alexandria and toured the ancient world, studied in Athens at Plutarch's school of Mathematics and her reputation for "The mind of Plato in the body of Aphrodite", was treated like royalty. Returning to Alexandria she first taught mathematics and later philosophy, drawing scholars from around the world to hear her lectures. Hypatia authored several treatises on mathematics including papers "On the Conics of Apollonius", apparently forever lost, and "On the Astronomical Canon of Diophantus" a portion of which reemerged from the Vatican library during the Renaisance. However, while she was well regarded as a mathematician, her real fame was as a philosopher. Letters from around the world were delivered to her - even though addressed merely with "The Muse" or "The Philosopher". A true polymath, as an atrologer and applied engineer, she is credited with inventing an astrolabe and a planesphere and as a physicist and applied engineer, she is credited with having developed a water still, a hydroscope (a form of densitometer for measuring the density of liquids) and a level measurement system. Often said never to have married because, "she was wedded to the truth", it has been suggested (by her enemies) that she had a number of lovers. It seems more likely that she had a husband, as Hypatia seems to have been known for her chastity, virtue, and beauty as much as for her ideas. If she had not been married, it is likely that her enemies would have made a great deal more fuss about her "brazeness" in an era of Isreali-Palestinian-style conflict between pagans and Christians. Instead they (Damascius' Life of Hypatia) told the story, "She was so beautiful and shapely that one of her students fell in love with her and was unable to control himself and openly showed her a sign of his infatuation. Uninformed reports had Hypatia curing him of his affliction with the help of music. The truth is that the story about music is corrupt. Actually, she gathered rags that had been stained during her period and showed them to him as a sign of her unclean descent and said, 'This is what you love, young man, and it isn't beautiful!' He was so affected by shame and amazement at the ugly sight that he experienced a change of heart and went away a better man." If she was indeed married, her husband may well have been Isidorus the philospher, who like her father has been eclipsed and largely forgotten. Belonging to a school of Neo-platonic thought her doctrine was thoroughly in opposition to the prevailing Christian dogma which, traditional Roman tolerance being cast aside, had been made compulsory in 390 CE. However, Hypatia had ignored this and continued teaching the neoplatonic position. Her prominence, widespread popularity, and friendship with Orestes, prefect of Egypt, tended to counter the jealous anger of Cyril, the Christian patriarch and Bishop of Alexandria. In 412 CE, Cyril zealous in his eagerness to stamp out pagan religions, destroy the temples, and monuments, and perhaps aggravated by Hypatia's continuous rejection of the Pauline doctrine that women should be subservient to men and silent in public meetings, and almost certainly driven by political concern and jealousy having seen the crowds waiting to greet her, ordered her death. An unwashed, mindless, classless band of Egyptian Christian monks seem to have been spurred on by Cyril did the deed. (Life of Hypatia, by Socrates Scholasticus) "Some of them, therefore, hurried away by a fierce and bigoted zeal, whose ringleader was Peter (the reader, a high church position in those illiterate times), waylaid her returning home, and dragging her from her carriage, they took her to the church called Caesareum, where they completely stripped her, and then inhumanly butchered her with pottery shards. After tearing her body in pieces, they took her mangled limbs to a place called Cinaron, and there burnt them." One can almost hear the words of the mob, and their subsequent laughter, "Paul tells us women should be silent, now this one obeys." Today the Church of Virus is pleased to Illuminate Hypatia as our second Saint. A person whose works, influence and life, can act as an example to all, though hopefully without being cut up by the believers. "Hypatia: Mathematician, Astronomer, and Philosopher" by Nancy Nietupski in Alexandria 2. An excellent presentation and discussion of the known facts and implications. The Life of Hypatia from The SudaEleventh Century Source First English translation of this important source. The Life of Hypatia by Socrates Scholasticus Primary Source Biographical entry describing her murder. The Life of Hypatia by John, Bishop of Nikiu Primary Source Contemporaneous Christian: Hypatia was murdered because "she was devoted at all times to magic, astrolabes, and instruments of music." Project Gutenberg's complete etext of Kingsley's book. The Lady Philosopher of Alexandria Challenging revisionist position lagely based on Maria Dzielska's book (infra). Source of the above image. I do have some issues. For example, the book asserts that the contemporaneous dates and ages ascribed to Hypatia must be wrong, because otherwise Hypatia would have been the same age as her students. Yet I have seen younger lecturers than students on occasion. I'd like to see stronger grounds for rejecting evidence and replacing it with hypothesii. "Hypatia of Alexandria" maintained by Howard A. Landman. This is a wonderful comprehensive site with copies of many 18th-20th Century references. Includes a "Book List" with an extensive list of references that you would get if you entered "Hypatia" into every library system in the world. Many in foreign languages. "For The Life And Work Of Hypatia Of Alexandria" maintained by Michael A. B. Deakin of Monash University in Australia. An invaluable resource for those who want to go to the horses' mouths - so to speak. But it's still useful to have a professional historian put these primary sources in the context of their times. "Hypatia of Alexandria Mathematician, Astronomer, and Philosopher (d. 415 C.E.)" One of the better (of many) brief biographies on Hypatia on the web. Hypatia of Alexandria, Maria Dzielska, Harvard University Press, 1995. A book filled with good research and doubtful conclusions. I would suggest that this book by the Polish Author, Maria Dzielska, fills the role of an updated version of "The History of Hypatia, a Most Impudent School-Mistress. In Defense of Christianity against the Silly Pagans." "Through the Flower" - a comprehensive web site about Judy Chicago and her various projects including The Dinner Party. Hypatia, Elbert Hubbard, Little Journeys to the Homes of the Great, Vol. X, Great Teachers A reasonably well written if somewhat unreliable read. --- Hypatia has been discussed on multiple occasions on the Church of Virus BBS and list. See also http://www-groups.dcs.st-andrews.ac.uk/~history/Mathematicians/Hypatia.html and http://poly.polyamory.org/~howard/Hypatia/Hubbard_1928.html. A beautiful lady by all accounts, a philosopher, an engineer, an erudite and eloquent conversationalist, an intellectual leader, and the first woman known to have made a significant contribution to mathematics. Murdered by the Christians in March 415 CE, just a few years after they had burnt down the Library of Alexandria. She taught Neoplatonics and came to represent Science and Mathematics - or as the Christians called it, "paganism," which was why they murdered her. Her death marked the marked the start of the diaspora of the scholars of Alexandria, the loss of much ancient knowledge and technology, and the beginning of the rule of Christianity, appropriately known as the "Dark Ages." Despite her writings having been destroyed, the memory of her has endured through the ages. A life so bright that not even the Dark Ages could supress her memory completely. One relevant quote and a cross reference. The cross reference is the post "RE: virus: saints", Hermit, 2001-04-07. And the Quote: "All formal dogmatic religions are fallacious and must never be accepted by self-respecting persons as final. Reserve your right to think, for even to think wrong is better than not to think at all! Fable should be taught as fable, myth as myth, and miracles as poetic fancies. To teach superstitions as truth is horrifying! Men will fight for superstition as quickly as for truth -- even more so, since a superstition is intangible you can't get at it, but truth is a point of view, and is so changeable!" 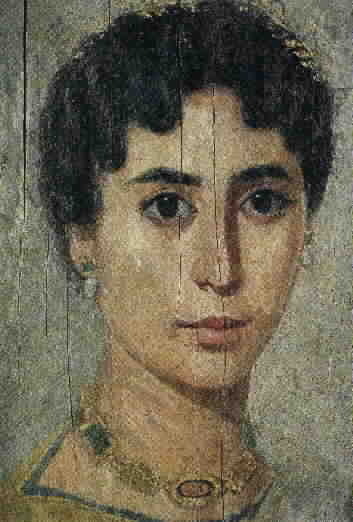 Hypatia 370-415 C.E. Few would make better candidates for sainthood in the Church of Virus. Last edited on Tuesday, November 16, 2010 3:09:48 pm.